F1?s new restrictions on radio messages made little difference to yesterday?s Australian Grand Prix according to drivers. The FIA planed wide-ranging new restrictions on what information drivers could receive during races this year. But on the morning of yesterday?s race the ban was partially relaxed allowing teams to give their drivers greater information about strategies. ?I don?t think it changed much in the end,? said Sebastian Vettel. ?There?s a lot more for us to remember but you can argue that we?re here to race as hard as possible, not to play some memory games.? ?I had a bit of an issue somewhere halfway through the race, because we had an issue with the software. But I don?t think that?s very exciting for the crowd when I?m struggling with software issues and then don?t get displayed what I should have on the display, so I asked and fortunately we were able to fix it but it didn?t change much for the racing side of things.? ?It made no difference whatsoever? ? 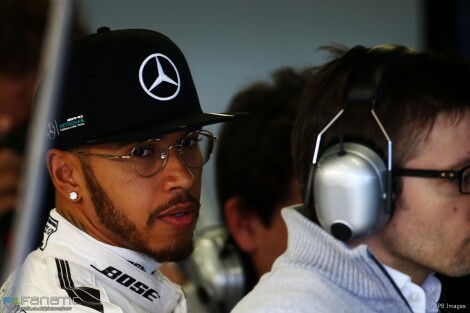 HamiltonLewis Hamilton also appeared to run afoul of the new restrictions: his engineer told him ?I can?t say? when Hamilton asked ?how do I turn the alarm off?? during the race. Information on how to operate the car is among the details no longer allowed by the rules. ?For me it made no difference whatsoever,? said Hamilton. ?Didn?t enhance the race.? However Hamilton said he appreciated the greater freedom drivers now have to adjust their car performance. ?It?s cool that we can, just for example with our engine we can control and decide what we?re going to do with it for once,? he said. Hamilton urged the sport?s rule-makers to focus on ways to make it easier for cars to follow each other closely. ?Otherwise, I don?t think the changes are necessary in that area,? he added, ?it?s more with the car, to enable us to follow each other.? ?Sebastian was right behind me on a better tyre but just because of the aero? that?s why he went wide, I guess. It?s just so hard to get close and that?s what we want to do, we want to be able to get and close and not have to use the DRS on the straight but be tucked up because you?re slip-streaming someone because you?re close enough.? Nico Rosberg was more positive about the changes to the radio rules. ?It was a good challenge because now it?s more down to us on track so that was cool,? said the race winner. ?You also feel more in control and it was more of a challenge like that.? ?They did make another change just before the race so we did get more information on strategy, just need to review whether that?s the way to go forward now or if there?s an even better way to do it. ?